Just like its big brother the Mini Tech-Tool from Boker Plus offers a simple, utilitarian and elegant slip joint knife that makes a great addition to your every day carry. The Mini Tech-Tool 1 is a minimal, single blade slip joint and comes with a single, hollow ground 12C27 blade and contoured black G10 handles. Blade: The utilitarian drop point blade is made from Sandvik 12C27 executed with a razor sharp hollow grind and beautiful polished finish. 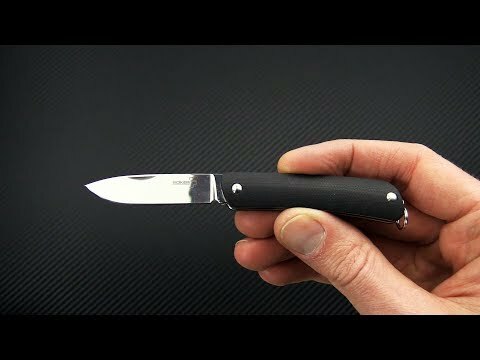 There is plenty of edge for light EDC tasks while maintaining a length that is legal in most areas. Opening is facilitated via a generous nail nick on the blade. Handle: The Mini Tech-Tool 1 has a simple, slip joint construction with stainless liners and back spring supporting smooth, contoured, matte black G10 handles for optimal comfort. The back spring offers secure use without a half-stop. The Mini Tech-Tool comes with a stainless steel split right for key chain carry. Sandvik 12c27: 12c27 is a high purity Swedish stainless steel with excellent edge performance allowing for razor sharpness, high hardness, exceptional toughness and good corrosion resistance. In addition to knives 12c27 is used in high-end ice skate blades and ice drills. Working hardness range is 54-61 HRC depending on the end use.